Are you tired of bailing bucket after bucket of water in order to drain a large area of water? How about sucking on the end of hose in order to start a siphon? The Slide N Pump eliminates these hassles, and makes it quick and easy to move water and other liquids from one place to another. This means that you can drain a pond or aquarium to clean it, and then pump clean water back in. You can also perform maintenance tasks like draining toilets, drying flooded areas and more. It is ideal for taking the water off the cover of your pool before opening it for the season, or completely emptying a child's pool or a spa. This tool is perfect for the do everything handyman, but it would make a good addition to any household. It is one of those tools that you won't necessarily use everyday, but when you need it, it will be a life saver. This is the mini size Slide n Pump, and it is more compact for storage and portability. If you are looking for one that can move more water in less time, then check out the regular sized version here: Slide N Pump. This small water pump and siphon starter has several advantages over electric versions. The most obvious is the cost. This is an affordable alternative that will do just as good a job as larger electric models will, but at a fraction of the cost. If you are not going to be moving water all day everyday, then this tool will suffice in almost every case. You do have to operate it manually to get it to work, but pumping it is easy, and it only takes a couple to start a siphon, and while pumping, each set of 10 pumps will move a gallon of water. Mixing water and electricity are not usually recommended, so by using this manual version, you eliminate this risk, and run no chance of electrocution, or motors being damaged by moisture. Thanks to the small size of this tool, it is way easier to store, and bring with you on the go. This makes it more convenient for just about anyone, and allows the user to take care of jobs away from the home without too much hassle. The Mini Slide N Pump also has an advantage over similar manual water pumping tools. This one is a pump and siphon starter in one, and pretty much every other tool that is similar will only be one or the other. This versatility adds value to the tool, but more importantly simplifies your life by allowing you to pump liquid, or siphon it depending upon the job or conditions present at the time. Use it as a regular style manual water pump, or use it to initiate a siphon. 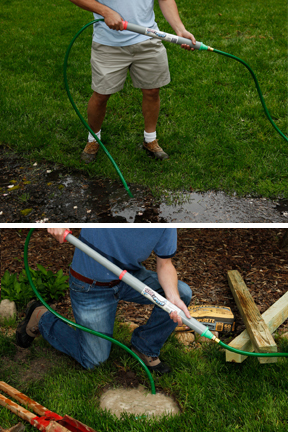 For basic pumping of liquid, simply attach a standard garden hose to each end. Insert the open hose end into any amount of water or other liquid to finish the set up. That's all there is to pumping water with this easy to use tool. Slide it back and forth to pump the water away. If you want to use it as a siphon, the procedure is similar, and you will set things up the same way. The Mini Slide N Pump is the only product of its kind available because it can pump liquid and initiate a siphon, while most products will only be good for one or the other. When conditions are optimal, a simple pump action will initiate the siphon and cause the liquid to start flowing. Once started it will continue until it is all removed. You can detach the Mini Slide N Pump once the flow starts, but that is not required. 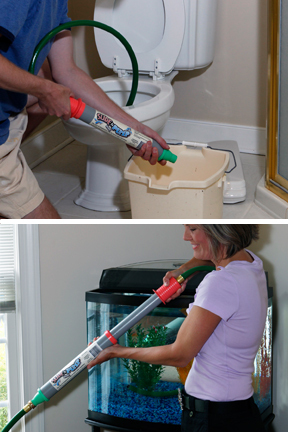 Perfect for removing liquid from a clogged toilet, pumping water out of a children's pools and hot tubs, aquariums and pond maintenance and so much more. With one of these on hand, disasters like leaky boats or flooded basements are much more manageable. If you have standing water, clogged drains and gutters, or just want to perform maintenance on your birdbath or outdoor fountain, this is the perfect tool for you. It works with a regular old garden hose and takes no skill or super human strength to operate. The Mini Slide N Pump is ultra portable, and will allow you to move liquid from one place to another without making a mess. It can move large volumes of liquid in a short amount of time, and it eliminates the hassle and cost of using a larger tool. For each ten pumps of this tool, you will be moving one gallon of water. When starting a siphon it only takes one or two. This means that you can pump out or siphon and drain several gallons of any liquid in just minutes. This is the perfect tool for jobs where you need to drain liquid, and it works in virtually any size space. Use for post holes, utility meters, toilets, basements, foundations, gutters, pools, ponds and more. Order Yours Today! Uses moving liquid from one location to another in space constrained areas. 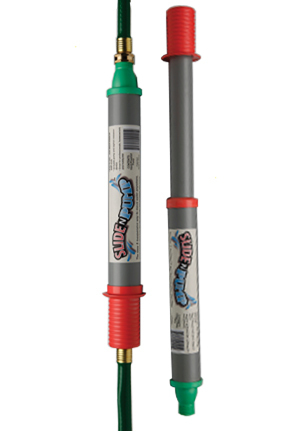 Mini Slide N Pump - Liquid Siphon Starter and Pumping Tool - A smaller sized water pumper and siphon initiator. Just a few pumps is all that it takes to start a siphon or pump water from one location to another. Order Yours Today! Awesome! Was exactly what I needed and worked great! Th Slide N Pump is easy to set up and use. I was draining a low lying flower bed and moved a lot of water in a short time. If you don't use the siphon function you'll get an upper body workout. I would definitely recommend this! Broke the first time I tried it. I was excited to try this product but didnt have a use for it immediately. About a month after I received it, I tried to pump out a small amount of water from a birdbath and the first pump filled the pump with water and the second time I pulled it apart, the plastic ring keeping the two parts together broke off and the pump pieces separated. I am not sure if I received a defective one or if this part is actually that cheap that it breaks this easily but I am more than unhappy that it broke the first time I used it. I have emailed customer support and hopefully I can exchange it. It isn't like I used excessive force either although I will say that pulling the two pieces apart does take some effort. I only used a 2 foot section of garden hose on one end of the pump but I imagine that using a long hose on each end would increase the effort required to operate this pump. Of course if you are using this pump to initiate a siphon, then this wouldn't be a major issue but if you are expecting to pump water through long hoses using just the pump action, be aware that it will require some elbow grease. Good concept and product design but poor quality construction based on my bad experience. simplygoodstuff response: Sorry to hear this. It sounds like you received a defective one as this is not normal. Please give us a call and we will help to resolve the problem. Terrific item--we're going to use it to winterize one of the buildings at a mountain home. . .it's great for pumping out the toilet bowl and tank. This pump was a great addition to our solar shower during a week long camping trip at the very cold Colorado river. My husband added a shower head and hose to complete the project which allowed us to place the very heavy water bag on a chair next to us (as opposed to trying to lift the bag). I pumped for his shower and he for mine. I got this to siphon water off my swimming pool cover. It works exactly as I wanted. I hook it to the hose, pump a few times and away it goes. The pump works great. I use to siphon water off a pool cover. Recommended. will this product work with the magic expansion hose? Yes it will. It would make a nice combo. can it be used for pumping diesel from a jerry can to the 4WD fuel tank? Can you ship to Australia? Yes. We do ship to your country. 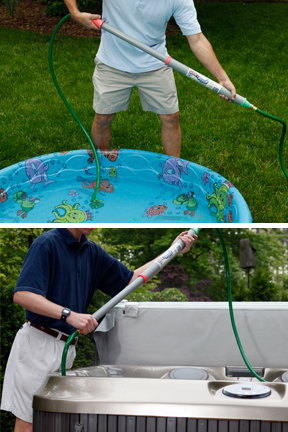 It is designed to work with most liquids, so it should be fine for your use, as long as the hose fits.